I am still busy purging, organizing and re-doing my den/guest room into a triple purpose room. It is now becoming a craft room as well. 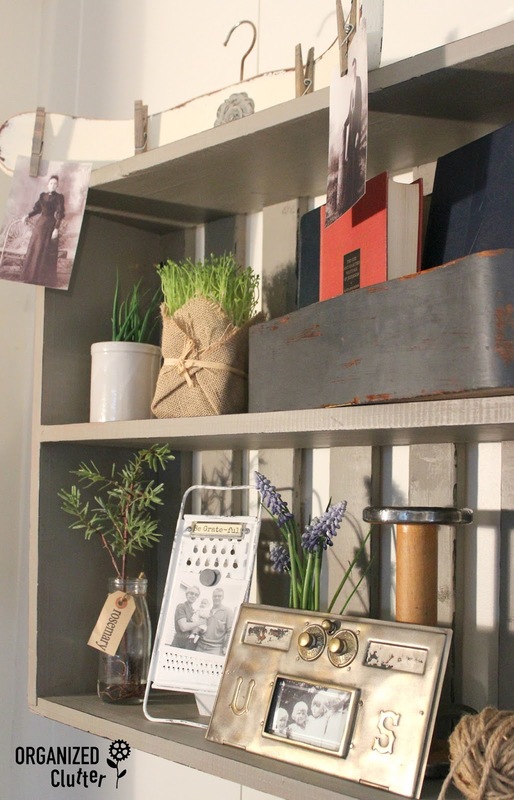 This rustic wooden shelf was used for a while in my shop for display. I decided to paint it with Annie Sloan Chalk Paint in French Linen and faux distress it with the Plaid Layering Block. I have shared previous projects with the Plaid Layering Block here, here, and here. I am planning to do a training video very soon on the Plaid Layering Block and share it on my blog. The upcycled shelf is now the home of some of my blog props, greenery, spools, twine, etc. I am also displaying some of my past blog projects, like this grater easel photo holder. One of my sewing drawers with books, jars, and more greenery on the next shelf. Do you remember the white chair back photo holder? The tutorial is here. I think old mailbox doors are great photo frames. I took this old rustic frame I have used in wall displays many times and added a rectangle of bead board paneling. I painted the non-grooved side with Annie Sloan Chalk Paint in Old White. I then printed out my logo on legal sized paper and did an image transfer using matte Mod Podge. There are many tutorials for this technique on Pinterest. So here are my updated hanging shelf, and my new logo sign. The shelves are a perfect place to "organize clutter"! More from my room update to come! I bet it feels good to get things organized. I love the rustic touches and your new logo sign. 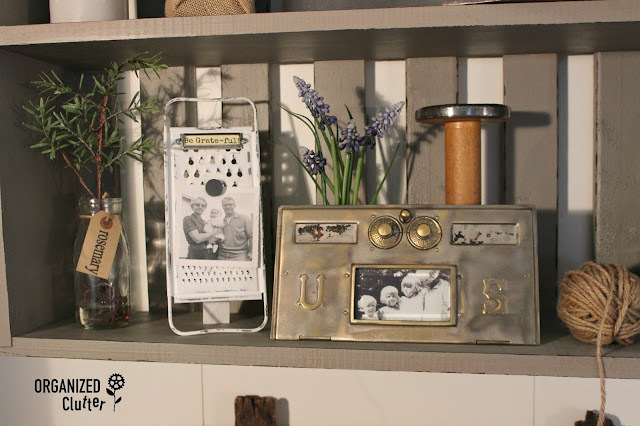 I've never tried the image transfer...I have a project for our house maybe I'll try this method. I love your projects...perfectly organized! You have the best ideas for makeovers. Neat the way you have them displayed! Your shelf is so awesome! I love all of the items displayed on it as well. Those are all cute. 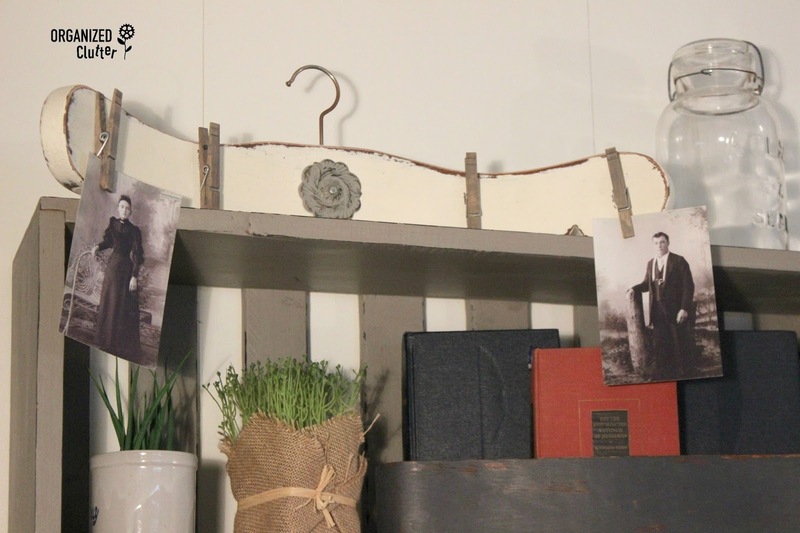 I love the shelf and the mailbox photo holder. You don't come up on those every day. 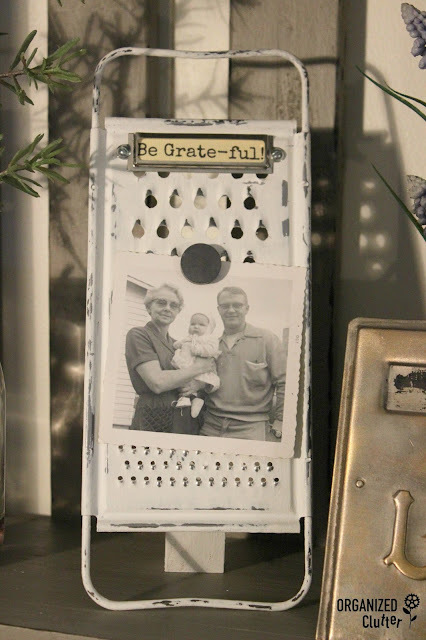 I love the grater photo holder! Very creative. And the shelf itself is nice in that color. I'm trying to think of something I have that I could paint with it! Nice logo! I like the color of that organizer.